Hasbro's The Hub network has announced they will air Transformers Prime Beast Hunters Predacons Rising movie (and epilogue to the series) on Friday October 4th at 8pm EST with an encore at 10:30pm EST. The DVD and Blu-ray release of the movie is set for the following Tuesday on October 8th with the season 3 set out on December 3rd. Press release below. This epilogue to the popular Hub Network series, "Transformers Prime Beast Hunters," takes viewers on a cinematic adventure with a captivating storyline and unforgettable characters and features amazing CG animation. In the "Transformers Prime Beast Hunters" series a fearsome new faction, the dragon-like PREDACONS, emerged on Earth and the AUTOBOTS adapted with never before seen BEAST HUNTERS abilities to battle this all new enemy led by the spectacular PREDAKING character. In "Transformers Prime Beast Hunters Predacons Rising," a resurrected UNICRON has taken over the now empty body of MEGATRON to seek vengeance on the AUTOBOTS and ultimately, the destruction of CYBERTRON. This formidable enemy forces an unlikely alliance between the AUTOBOTS, DECEPTICONS, PREDAKING and two new PREDACONS, who come together in an epic battle to help protect their newly restored planet. 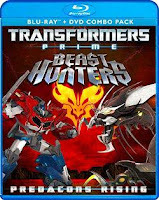 "Transformers Prime Beast Hunters Predacons Rising" is executive produced by Roberto Orci ("Star Trek Into Darkness"), Alex Kurtzman ("Star Trek Into Darkness"), Jeff Kline ("Men in Black: The Animated Series") and stars Michael Ironside ("Ultra Magnus"). It also stars the cast of "Transformers Prime," including Will Friedle ("Bumblebee"), Peter Cullen ("Optimus Prime"), Steve Blum ("Starscream"), Nolan North ("Smokescreen"), John Noble ("Unicron"), Peter Mensa ("Predaking"), Frank Welker ("Megatron"), Jeffrey Combs ("Ratchet"), Kevin Michael Richardson ("Bulkhead") and Sumalee Montano ("Arcee"). "Transformers Prime" ran on the Hub Network for three seasons, the last season of which was titled "Transformers Prime Beast Hunters." The Hub Network aired the series finale of "Transformers Prime" on Friday, July 26.